Everything is getting more and more expensive as the days pass. Food, clothing, transportation and other necessities are all more expensive than they were yesterday. And that includes rent. Even as the economy improves, with stagnant wages, affordable apartments seem to be a thing of the past. With 30% of the adult workforce earning minimum wage, it's getting harder to find an apartment. According to the National Low Income Housing coalition, you need to make $20.30 to be able to afford an average 2 bedroom apartment, without spending more than the recommended 1/3 of your income on your housing situation. With this in mind, there is some good news in that some states are a lot cheaper than others. 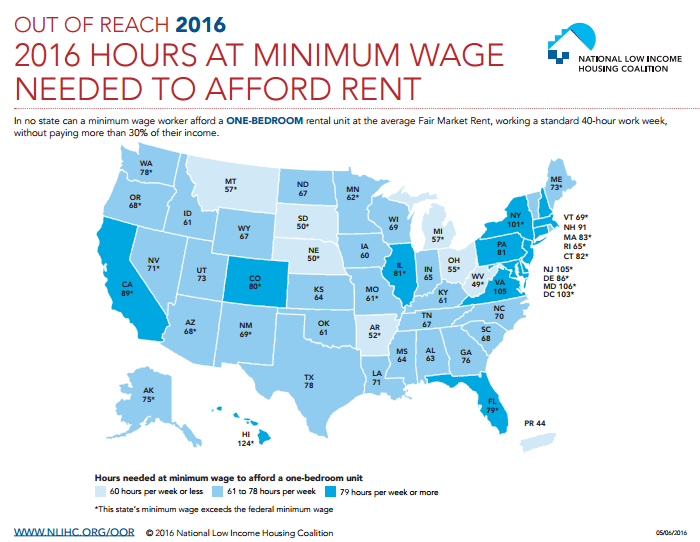 Hawaii is near the top of the list, with a person needing more than a $30 an hour salary to afford a 2 bed apartment, but Alabama and Iowa are closer to $15. Take a look at the list of states and their relative incomes, as well as the graphic above to get a better idea of what you should expect to shell out for an apartment.